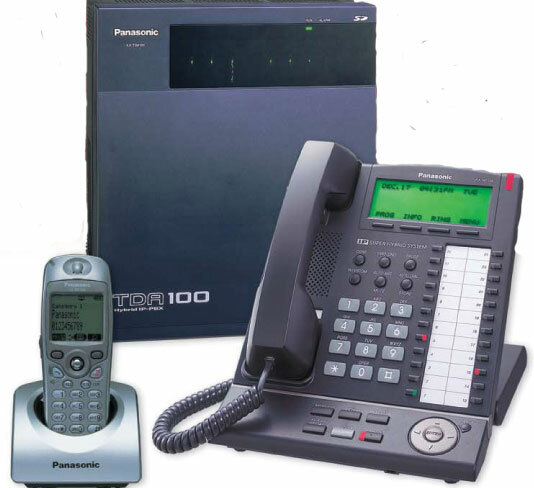 The KX-TDA 50/100/200 communication systems from Panasonic are powerful and versatile systems that will easily adapt to any business will help improve the way your business communicates with its customers. KX-TDA 50 Super Digital Hybrid-IP phone system allows up to 12 lines by 28 phones. KX-TDA 100 Super Digital Hybrid-IP phone system allows up to 46 lines by 48 phones. KX-TDA 200 Super Digital Hybrid-IP phone system allows up to 69 lines by 112 phones to 256 phones in DXDP. All three phone systems accept the new cordless cellular technology. The TDA 100 & 200 accepts the KX-TDA0350 soft phone in a laptop. Door phones, loudspeakers, music on hold, voice mail, voice to text, VOIP phones and call center features are also available with these phone systems. By adding a KX-TVA series voice processing system, your calls can be easily managed by using the built-in automated attendant service, voice mail with email integration, and more. And with the high level of integration between the KX-TVA and the KX-TDA, you can enjoy features like voice mail LCD menus that allow you to access and manage your voice mailbox using the LCD display and soft keys. With all these choices, it’s easy to custom design a system that’s right for you. Amertel can guide and advise you on the best system for your needs and how to integrate the KX-TDA into your business. For more information call us today at 1-201-935-8181 or contact us online. Phone Assistant Manager - use any networked PC with a web browser to use this "PA" to perform Add/Move/Changes to your phone system yourself.